Otherwise, it was an exceptional day for the Andretti Autosport driver from California, who won the Verizon IndyCar Series race at Mid-Ohio Sports Car Course by 12.8285-seconds. Rossi was the only driver in the 24-car field to complete the 90-lap race in two pit stops, while everyone else needed three. It made all the difference as Rossi picked up his fourth career win and second of the season. 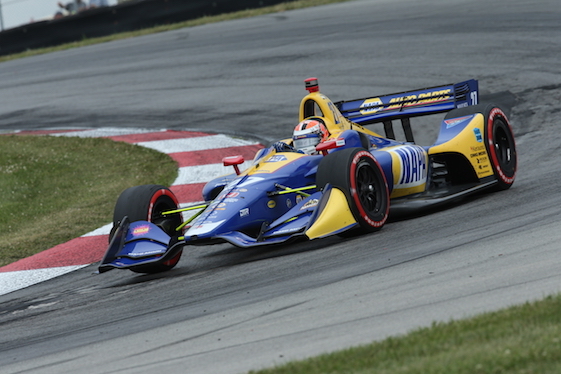 Rossi also advanced one position in the championship standings, moving into second place, 46 points behind four-time series champion Scott Dixon after 13 of 17 races. Starting from pole position after winning the Verizon P1 Award in Saturday qualifying, Rossi led 66 laps around Mid-Ohio’s 2.258-mile/13-turn permanent road-course in Lexington, Ohio. After achieving the necessary fuel mileage early, he and strategist Rob Edwards decided to gamble on the two-stop strategy. Rossi pitted for fuel and tires on Laps 29 and 59, running the final 31 laps/70 miles on a single tank. When Schmidt Peterson Motorsports’ Robert Wickens made his third pit stop from the lead on Lap 65, Rossi assumed first place and was never threatened. The victory was No. 60 for team-owner Michael Andretti and his organization in Indy car competition, but its first at Mid-Ohio. Rookie Wickens, driver of the No. 6 Honda, finished second to equal his best result at ISM Raceway near Phoenix in the second race of the season. The Canadian now has seven top-five finishes this season and is solidly in sixth place in the standings. Will Power finished third in the No. 12 Team Penske Chevrolet in his 200th Indy car race, just ahead of teammate Josef Newgarden in the No. 1 Penske Chevrolet. Dixon, a five-time Mid-Ohio winner driving the No. 9 Chip Ganassi Racing Honda, made career start No. 300 and finished fifth. Third on the all-time Indy car wins list with 44, Dixon now has placed in the top-five in exactly half of his races. With 150 top-fives, Dixon moved ahead of A.J. Foyt Jr. and alone into second place in Indy car history, trailing only Mario Andretti (194). “Basically, a frustrating day,” Dixon said after seeing his point lead shrink by 16. “I think the car had some good speed. We were really quick early on in a stint, (then) we kind of faded a little bit. The track condition was just not great. Sebastien Bourdais, who started last after crashing in qualifying on Saturday, carved through the field to finish sixth in the No. 18 Honda. It’s the Dale Coyne Racing with Vasser-Sullivan driver’s best finish since he placed fourth at the INDYCAR Grand Prix on the Indianapolis Motor Speedway road-course in May. The race ran under green-flag conditions the entire way for the third time in 34 Indy car races at Mid-Ohio but first since 2013. After 13 races, Dixon leads Rossi by 46 points, Newgarden by 60, Power by 87 and Andretti Autosport’s Ryan Hunter-Reay by 95. The series returns to action with the ABC Supply 500 at Pocono Raceway on Sunday, Aug. 19. Live coverage starts at 1:30 p.m. (EDT) on NBC Sports Network and the Advance Auto Parts INDYCAR Radio Network. In Indy Lights presented by Cooper Tires, Patricio O’Ward led an Andretti Autosport podium sweep for the second straight day. O’Ward’s victory was his seventh of the season and pushed his point lead to 32 over teammate Colton Herta, who finished second. And in the Cooper Tires USF2000 Championship powered by Mazda, Kyle Kirkwood completed a sweep of the three weekend races. The Cape Motorsports driver already has clinched the season title. Verizon IndyCar Series point standings: Dixon 494, Rossi 448, Newgarden 434, Power 407, Hunter-Reay 399, Wickens 380, Pagenaud 344, Rahal 335, Hinchcliffe 328, Bourdais 293.